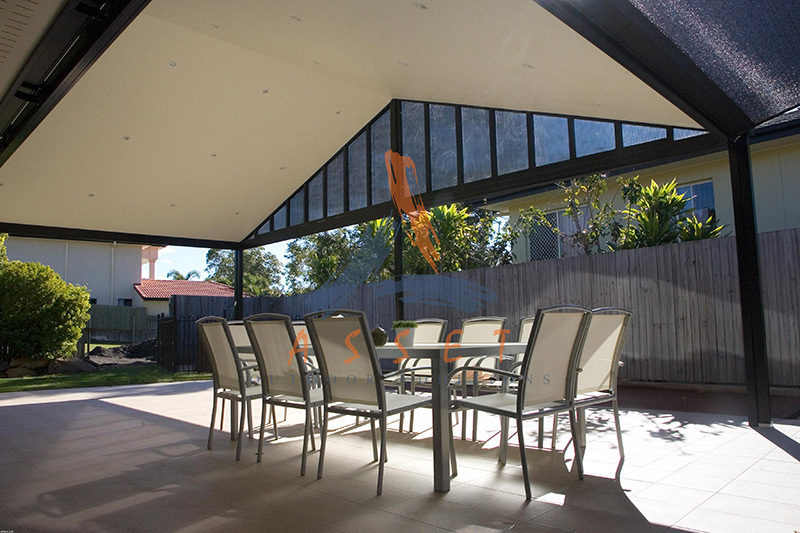 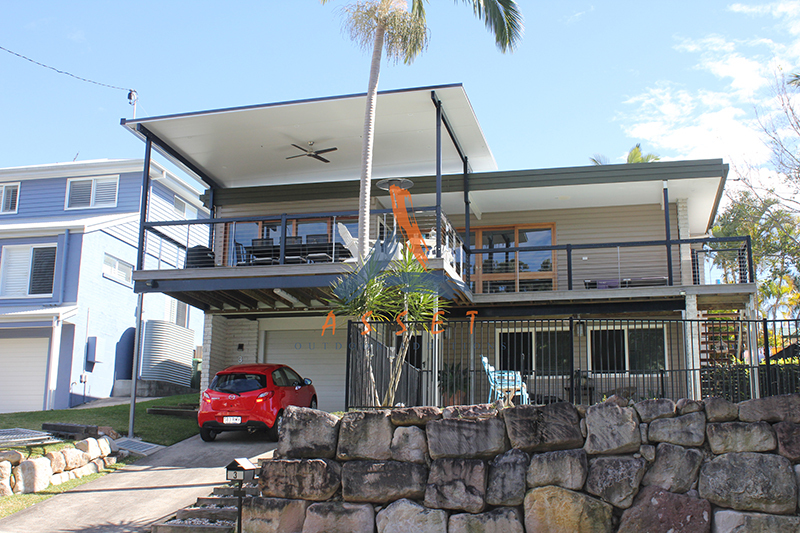 Transform your outdoor living area with Brisbane’s most innovative patio builders. 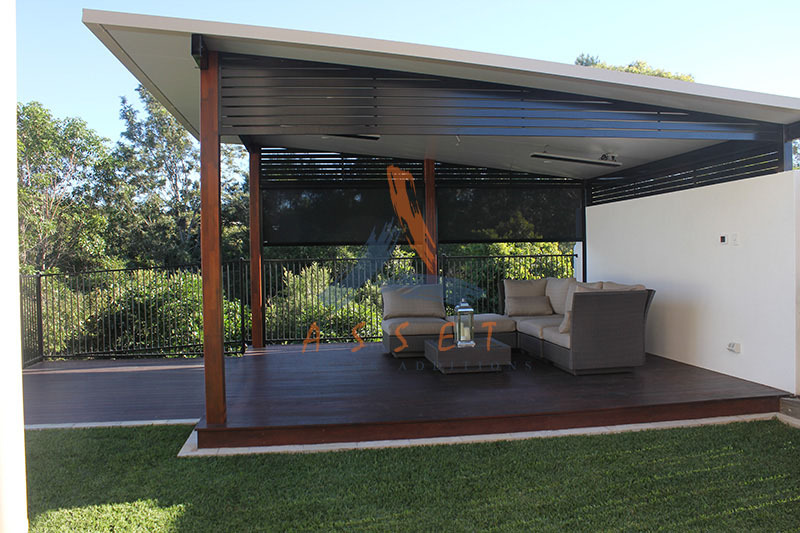 Whether you’re cooking up a storm on the barbeque for your family, entertaining friends, or just having a lazy day chilling on the outdoor furniture, an Asset patio is a great addition to any Brisbane or Ipswich home and we guarantee you’ll want to use it all year round. 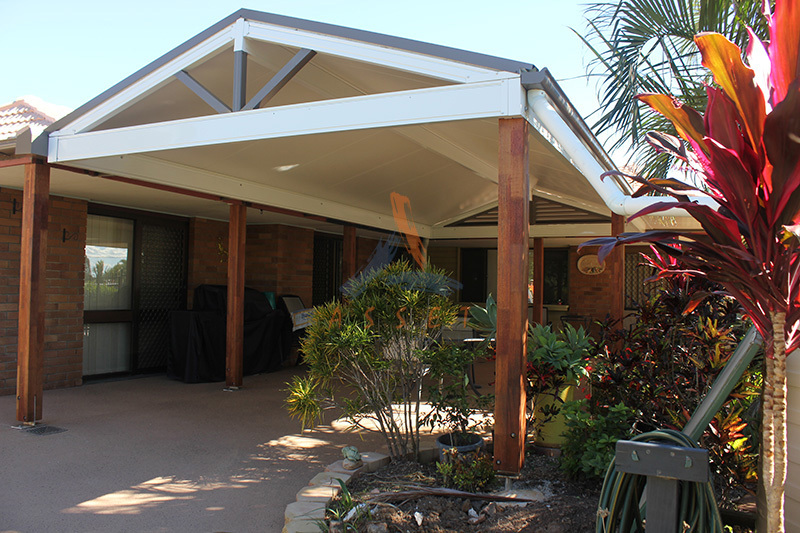 As well as providing you with an extra multi-functional living space, a patio built by a reputable patio builder could also save you hundreds on your power bill, because the specially designed insulation built into quality patio roof systems helps to reduce the temperature inside your home. 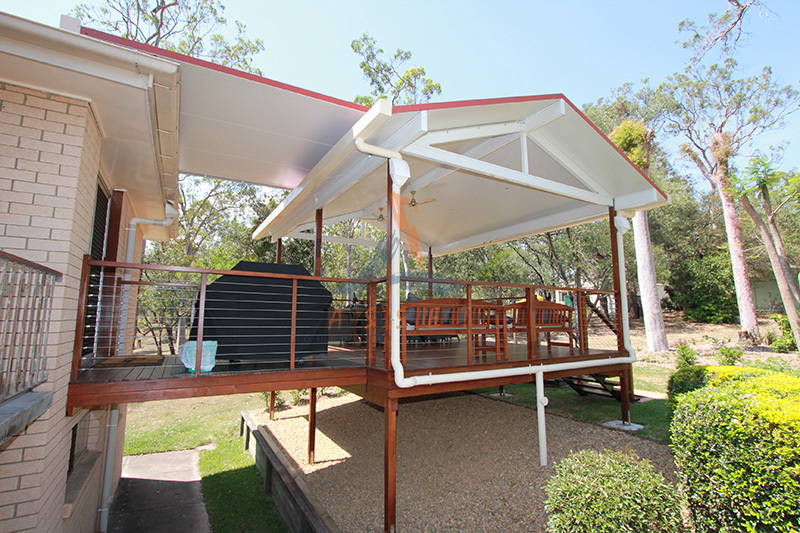 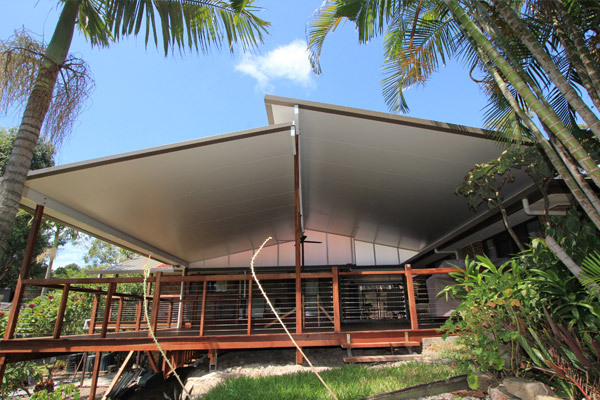 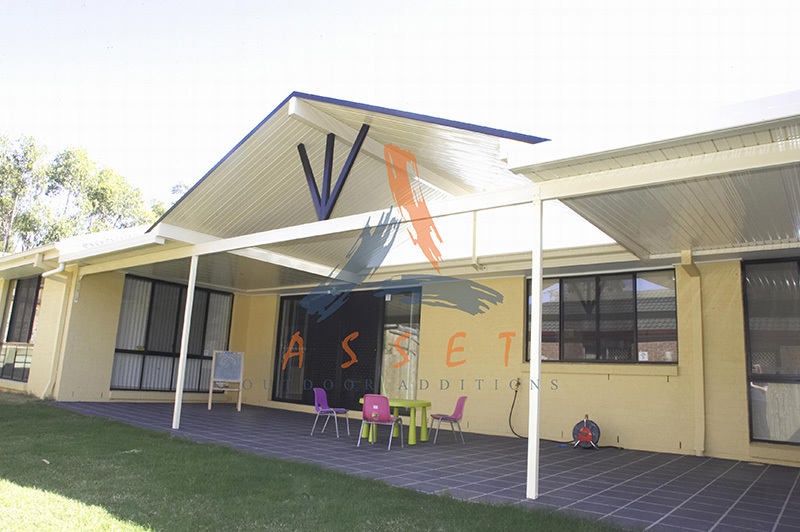 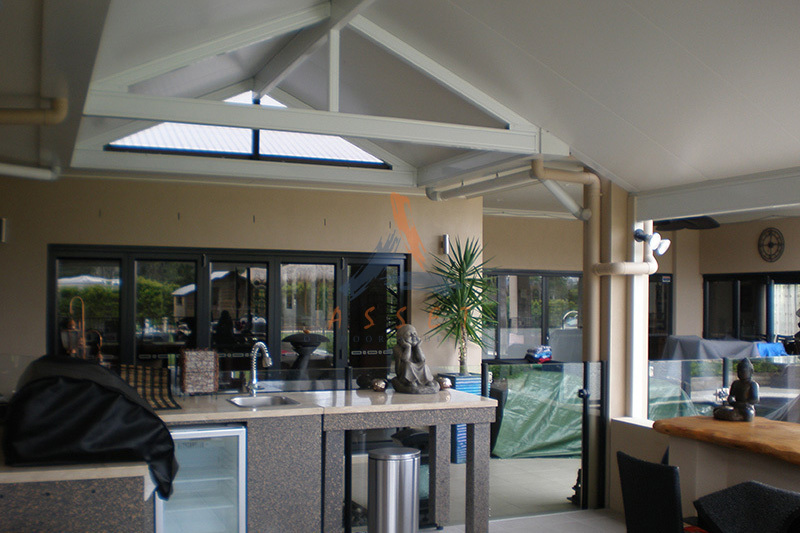 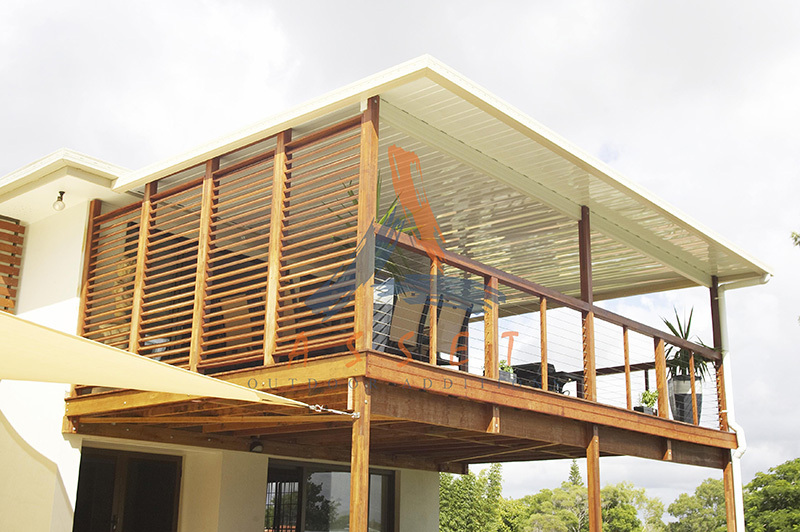 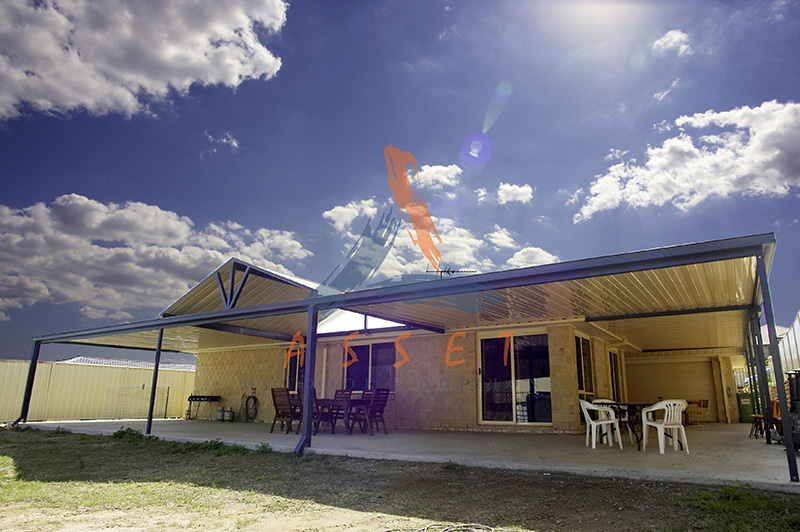 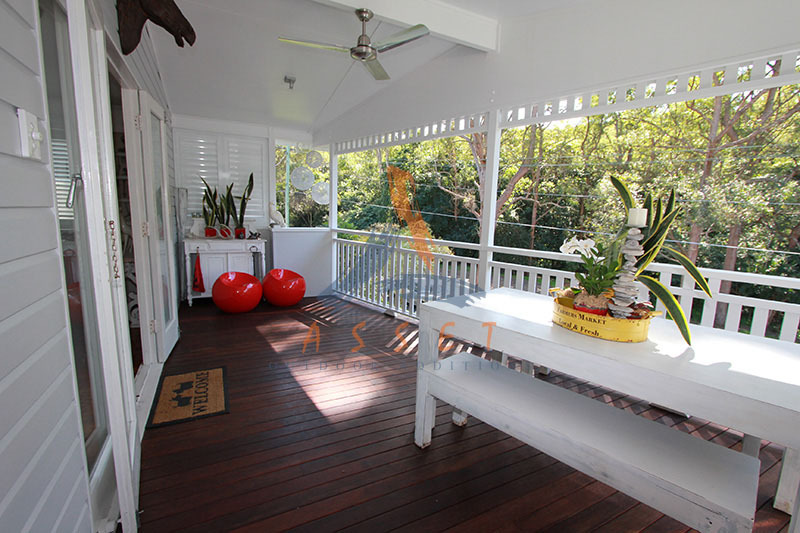 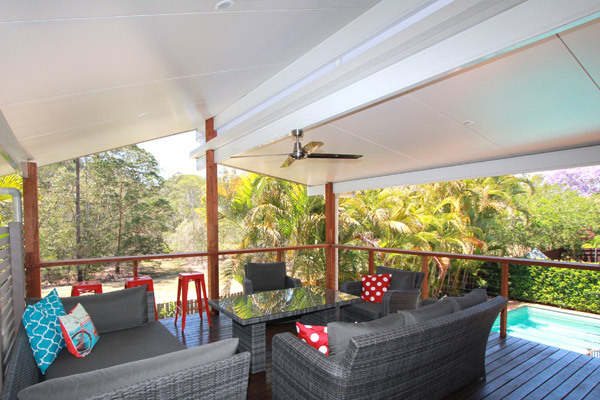 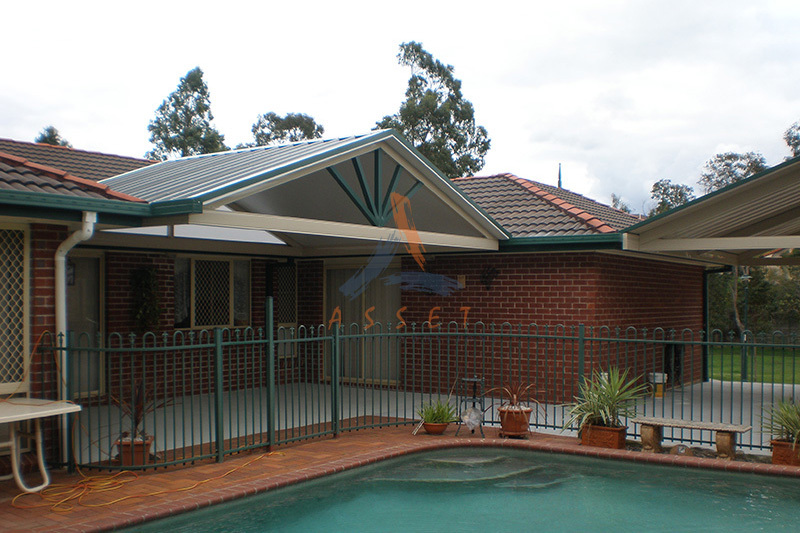 Choose from a range a great styles and enjoy the beautiful Queensland weather under an Asset patio roof. 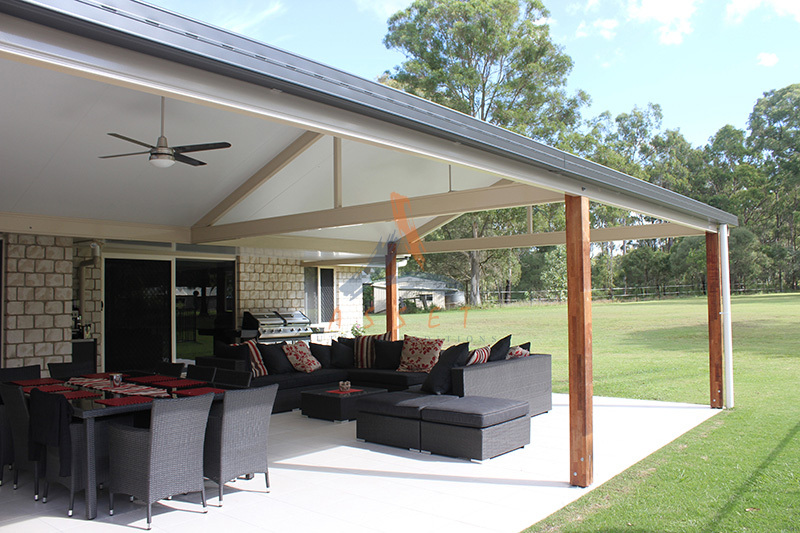 Made from quality BHP steel by local manufacturers, your new patio will be durable, long-lasting and made for Qld’s harsh conditions. 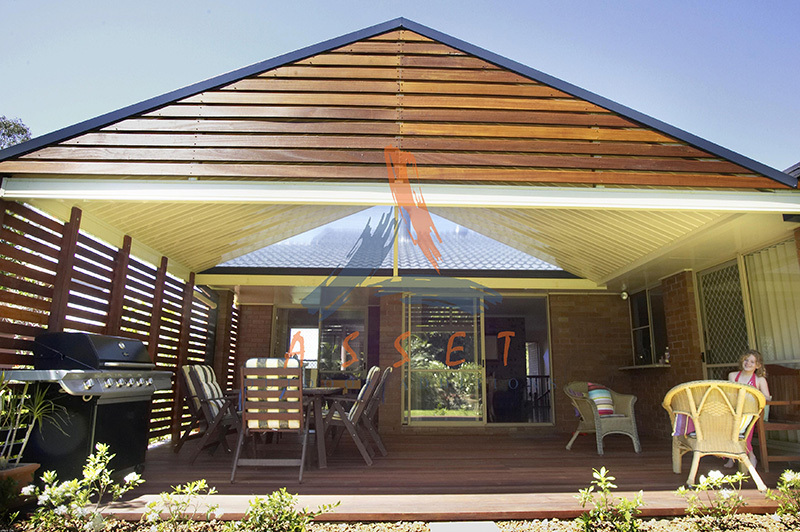 Premium finishes and a range of modern colours available to perfectly complement your house. 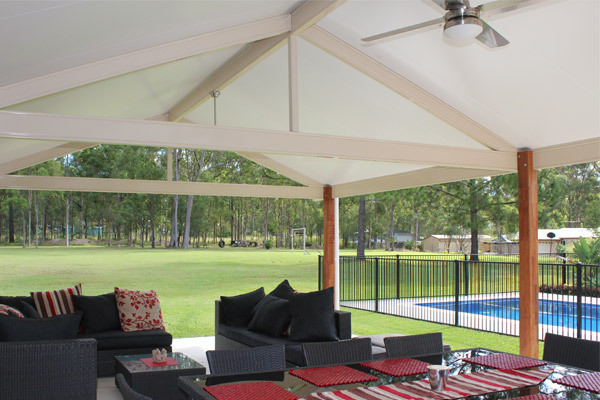 All of our designs are engineered for maximum strength all while using long spans and keeping posts to a minimum. 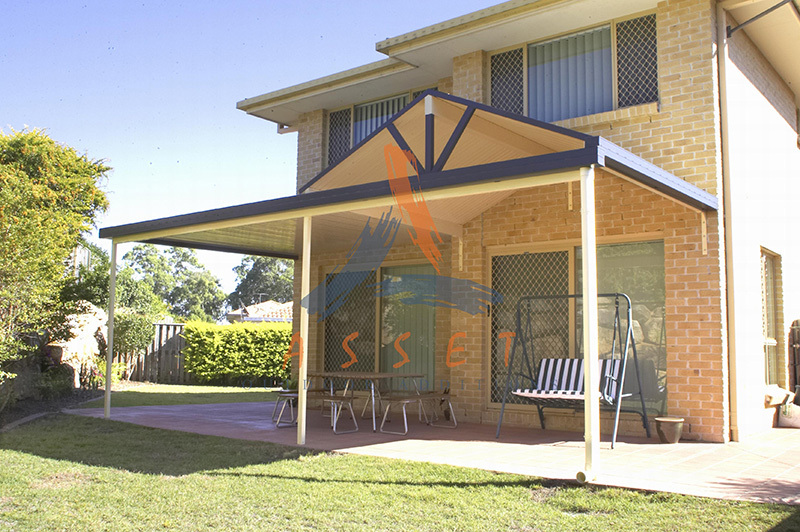 We use quality Australian made materials. 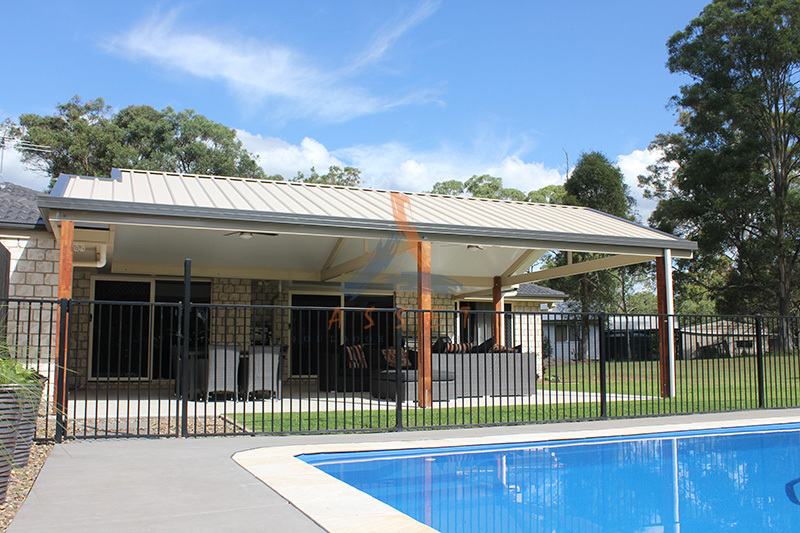 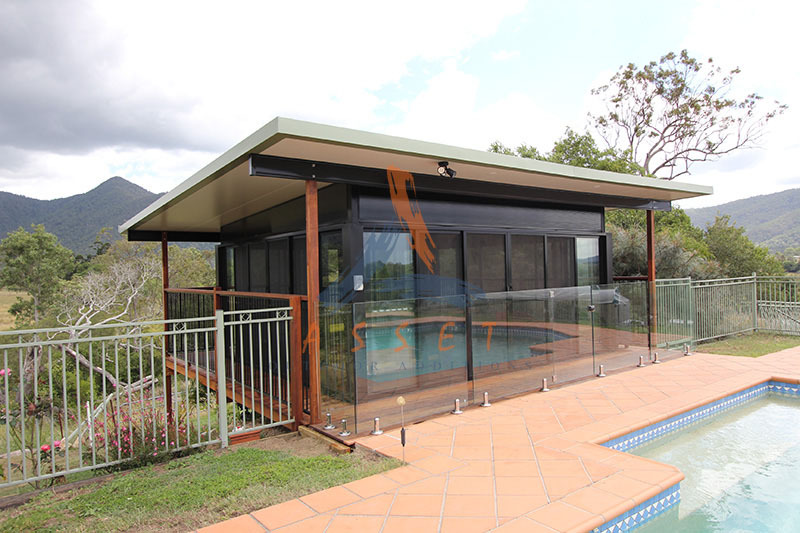 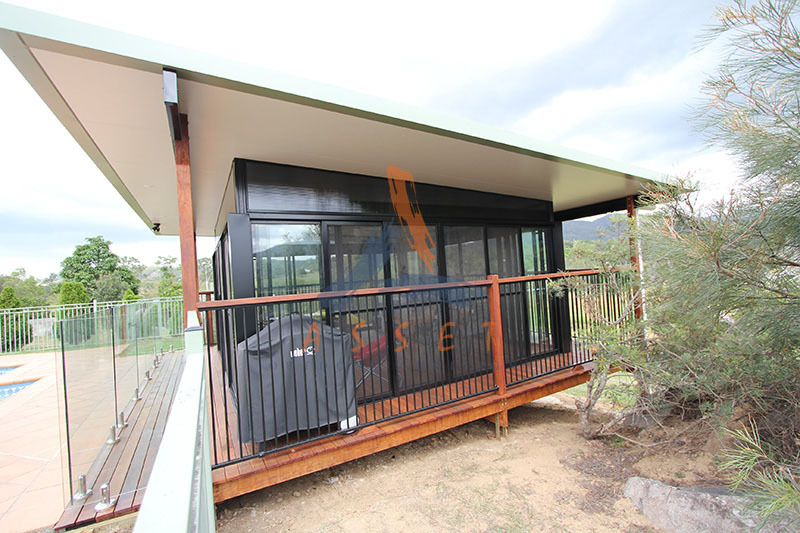 All of our patios are constructed using quality BHP steel, and other quality products manufactured in south east Queensland, ensuring your patio will be durable and long lasting. 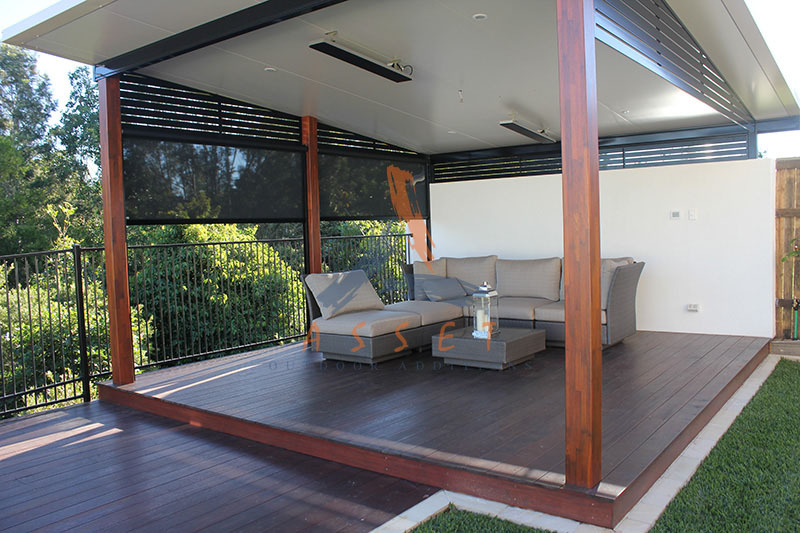 All products are coated with premium finishes that provides a sleek finish to the look of your patio. 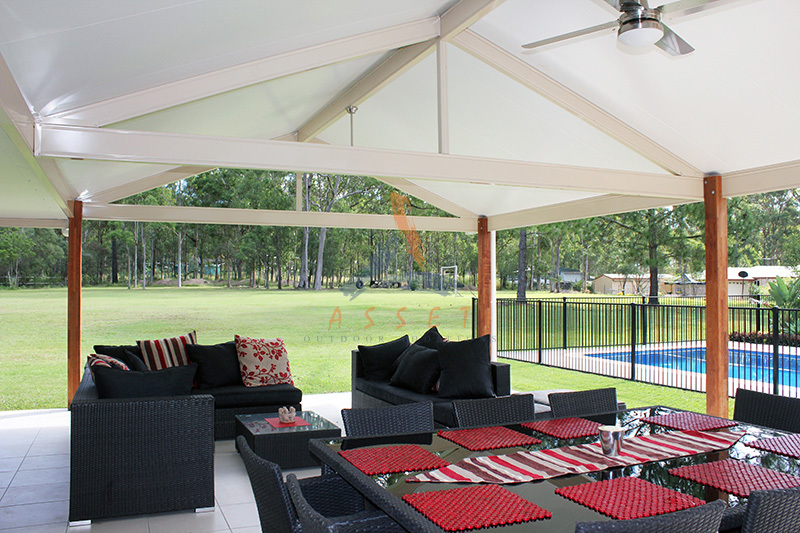 And with a range of colours to choose from, your new patio will be designed to perfectly complement your home. 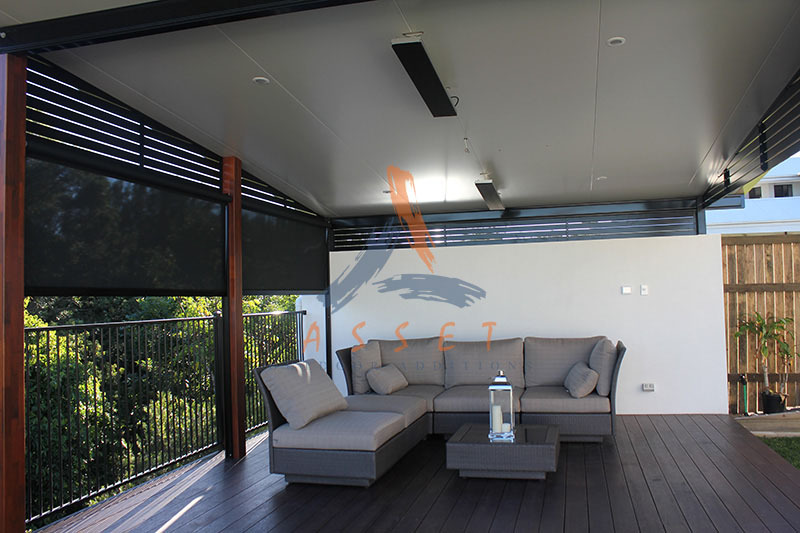 And to finish the look, Asset can supply a range of stylish accessories such as infills, privacy screens and blinds. 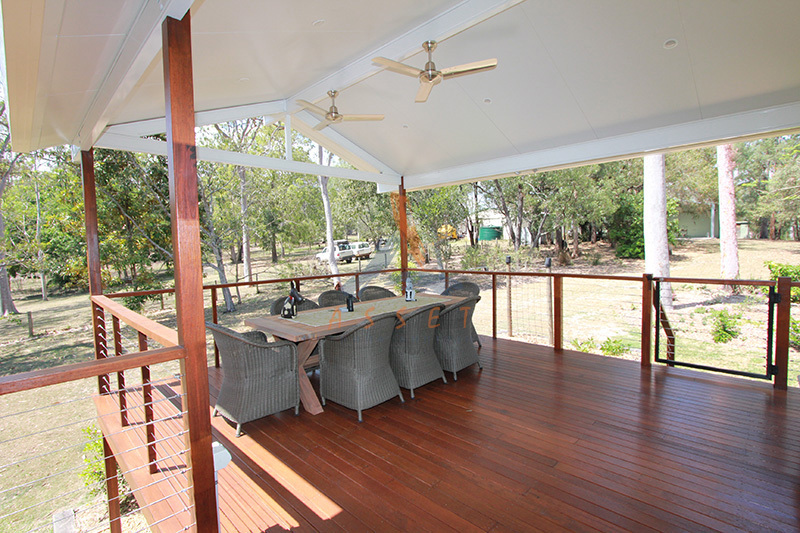 Or maybe complete the area with a stunning timber deck. 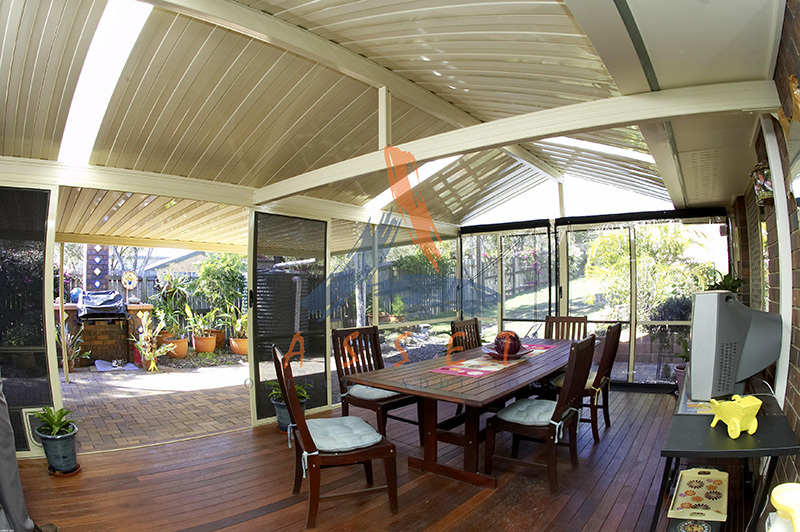 We’re patio builders with designer ideas. 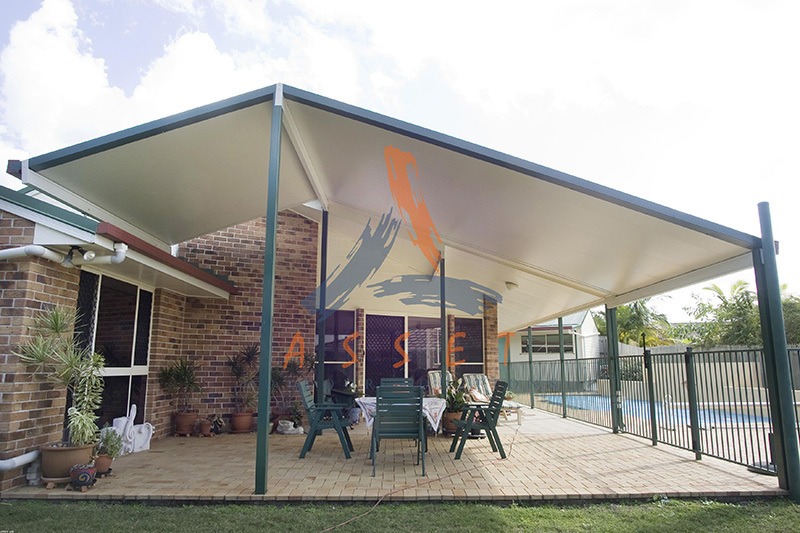 Because all of our patios are custom designed, Asset can build just about any patio roof design imaginable, from traditional flat patio, gable patio, flyover patio, insulated patio or designs out of the box. 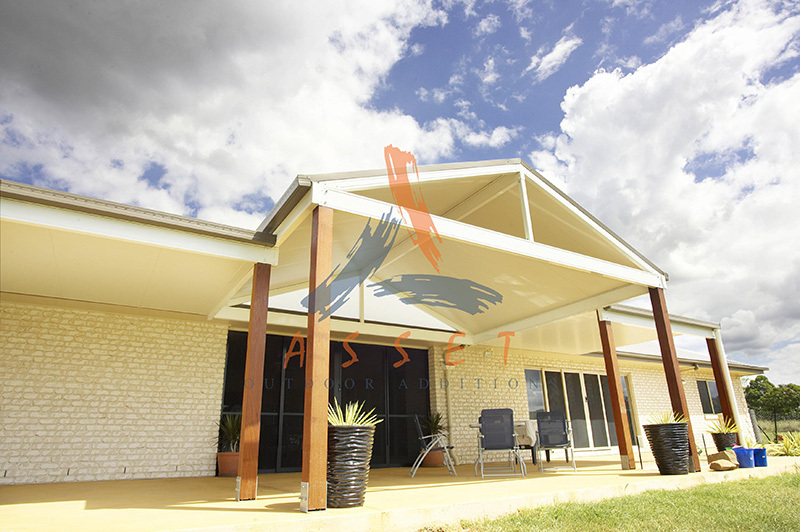 Our team of highly trained professionals will visit with you in home, listen to your ideas and work out the best design for your home. 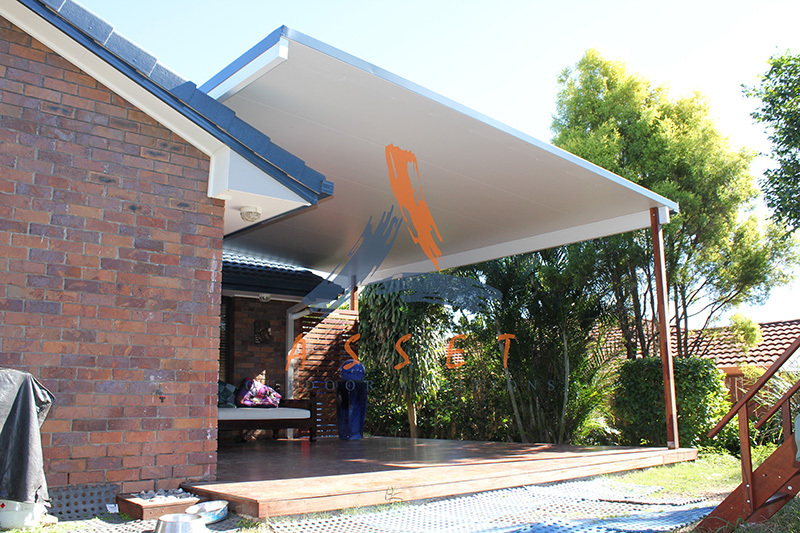 Even when the other patio companies tell you it’s too complex to build, we are 100% confident Asset will have the solution. 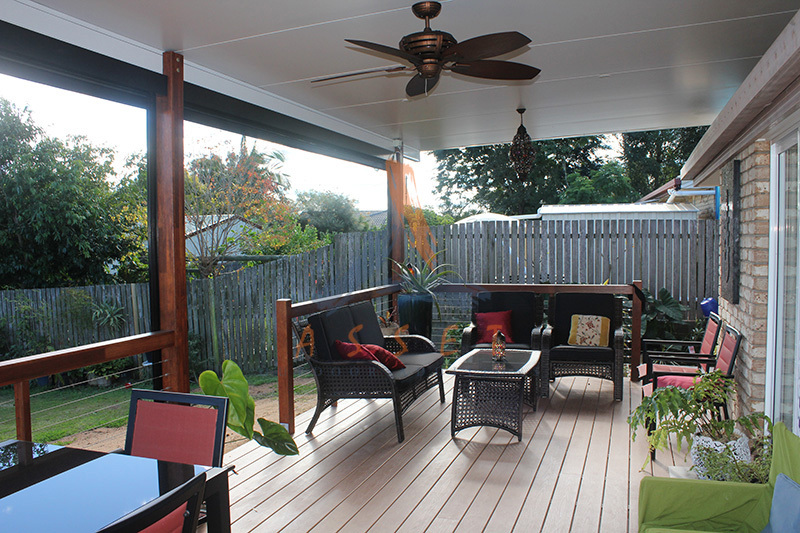 Checkout some of the patios we’ve built throughout Brisbane. 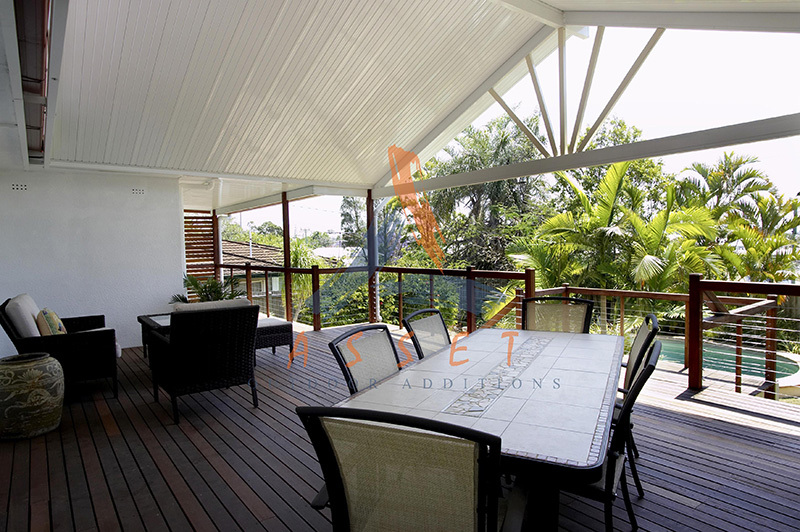 Patios are a lifestyle in Brisbane and south east Queensland! 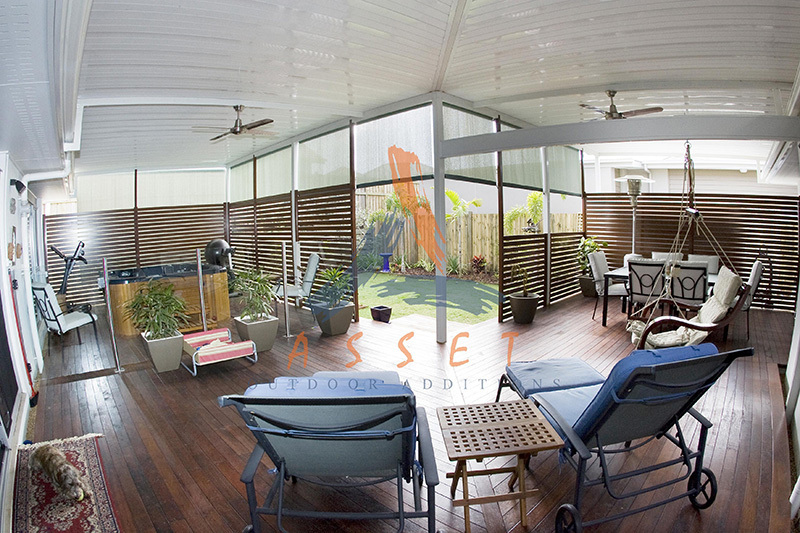 Here we have a selection of patios in Brisbane that were designed, planned and built by our expert team at Asset Outdoor Additions. 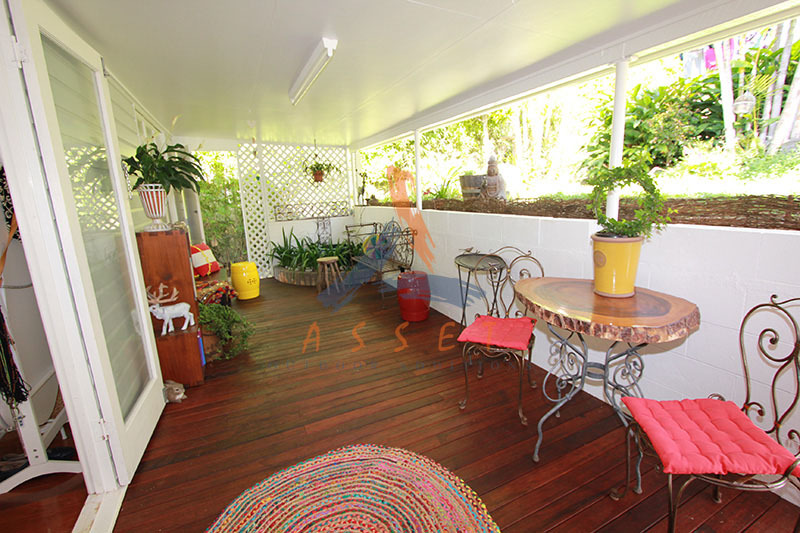 This is a great way for you to get some ideas for your own Asset patio. 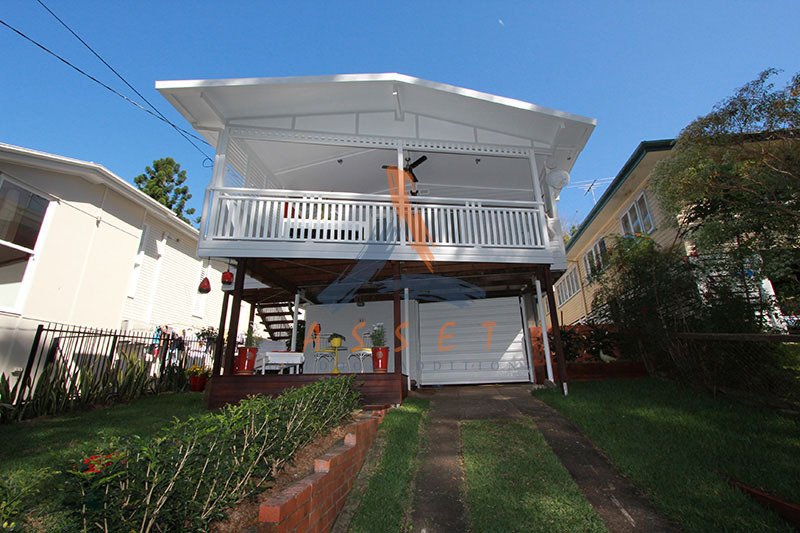 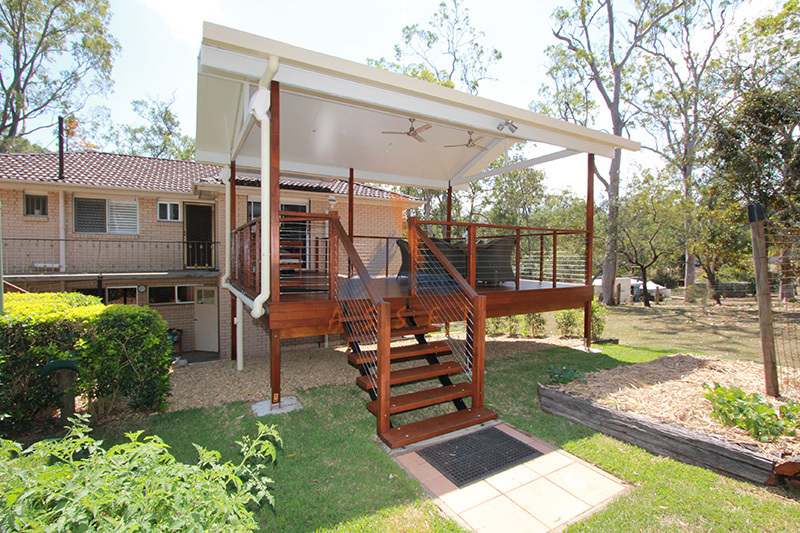 Patio solutions for greater Brisbane, including Ipswich and surrounds. 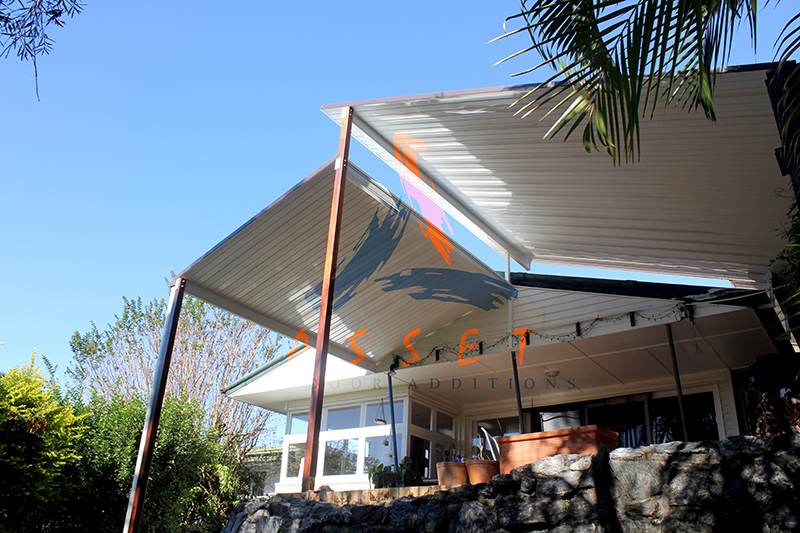 Not located in the Brisbane CBD? 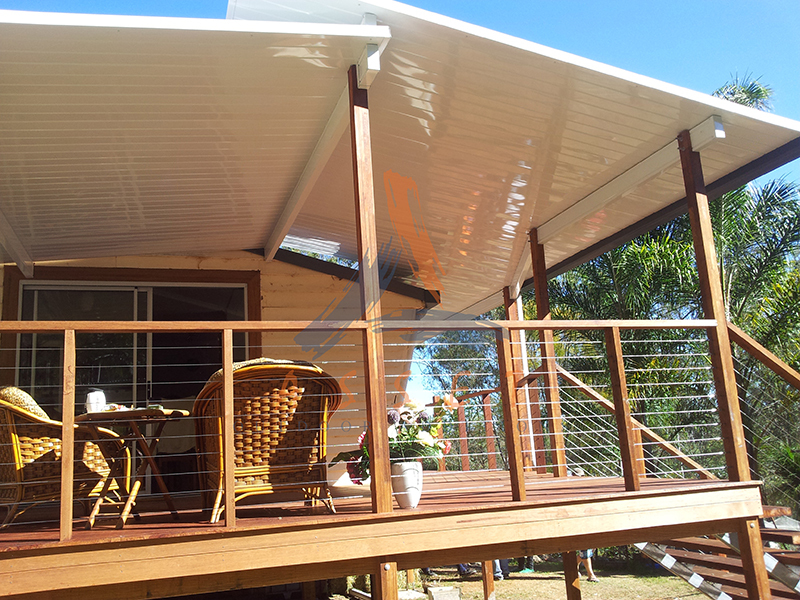 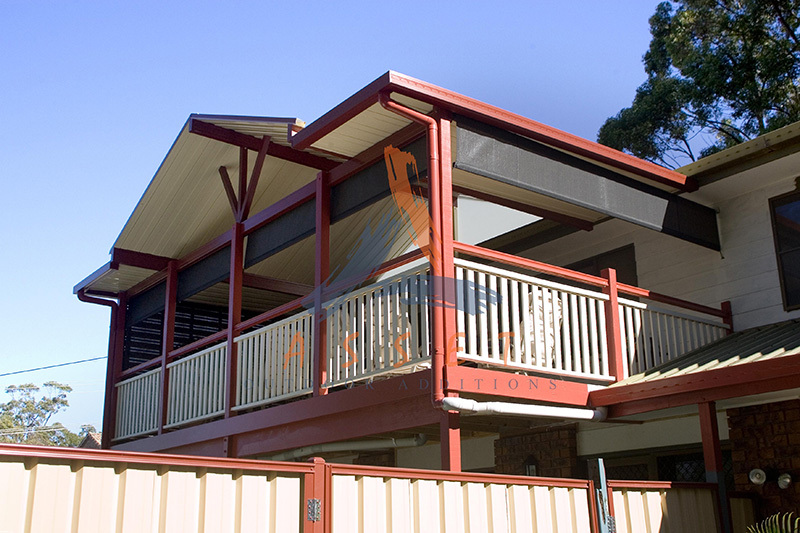 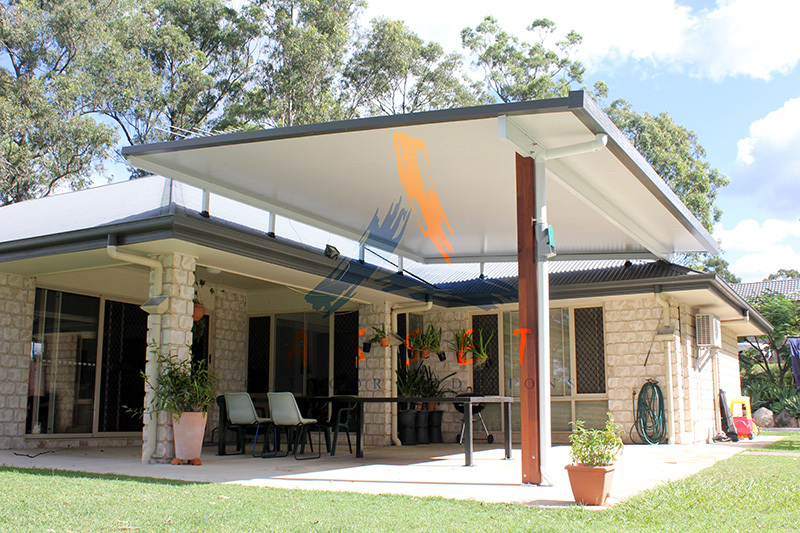 No problems, we supply and build patio roof solutions to residents throughout greater Brisbane, including Southern and Bayside areas, northern suburbs, the western region, Ipswich and surrounds. 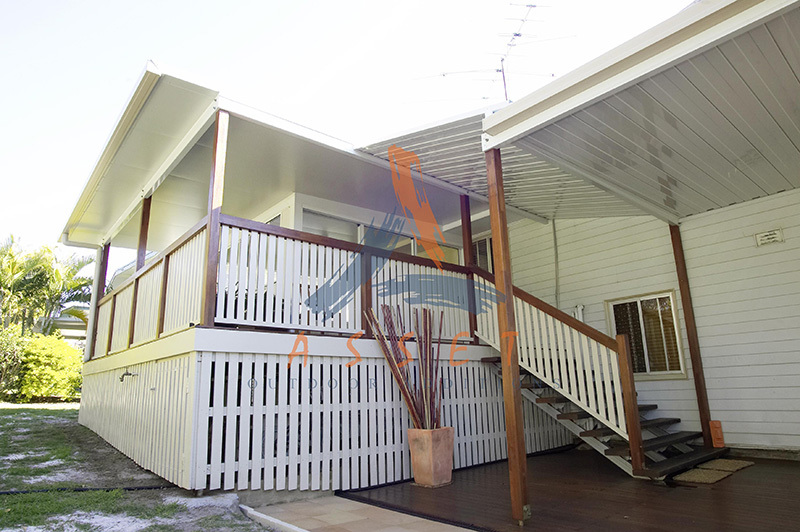 We provide a prompt and reliable service from start to finish, including all your council approval requirements. 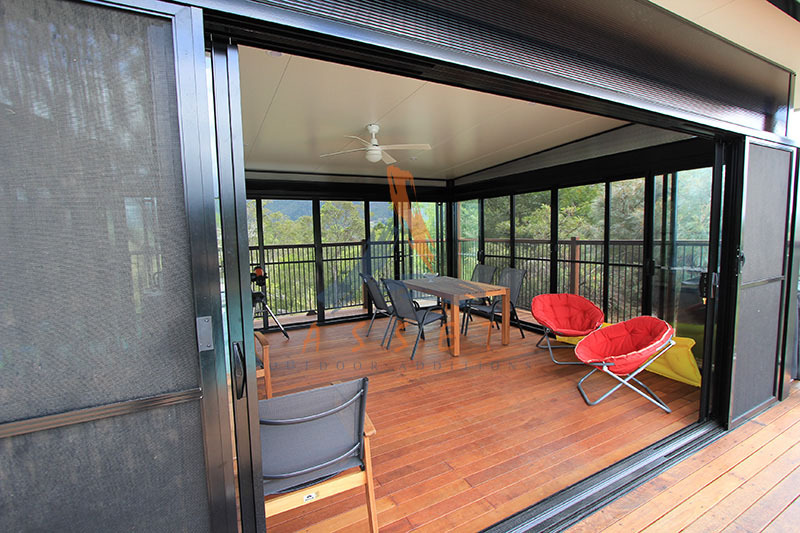 So you will be enjoying the outdoors sooner than you can imagine. 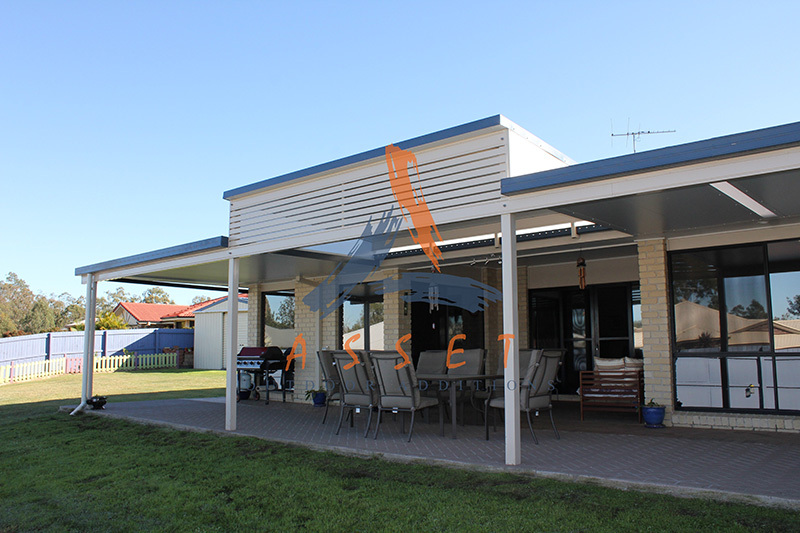 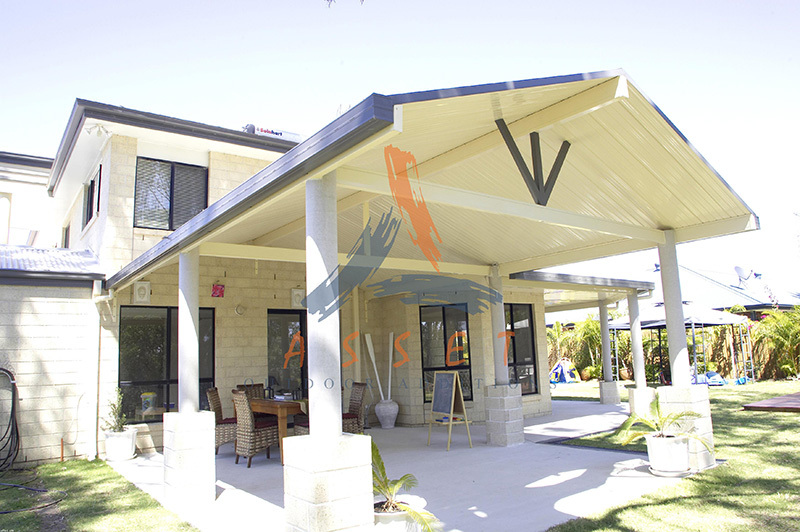 "We can’t thank Asset enough for the wonderful patio they designed and built for us! 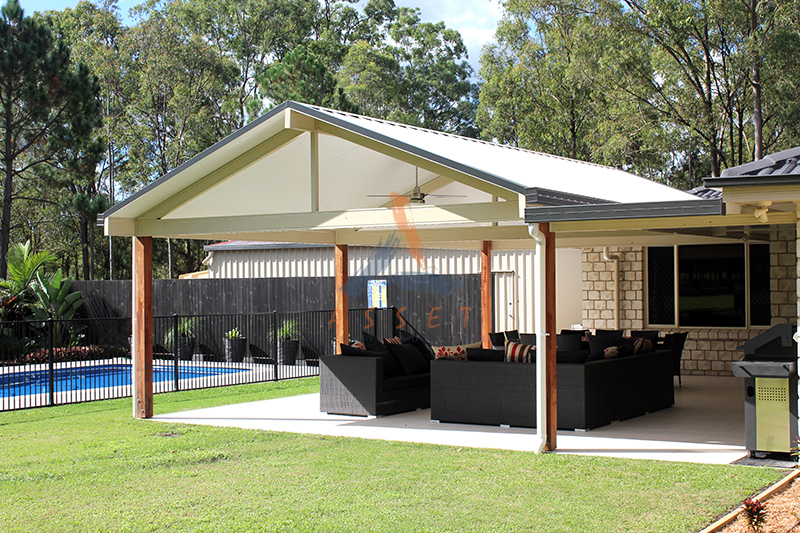 It perfectly complements our house, and now we can enjoy the outdoors just that little bit more!" 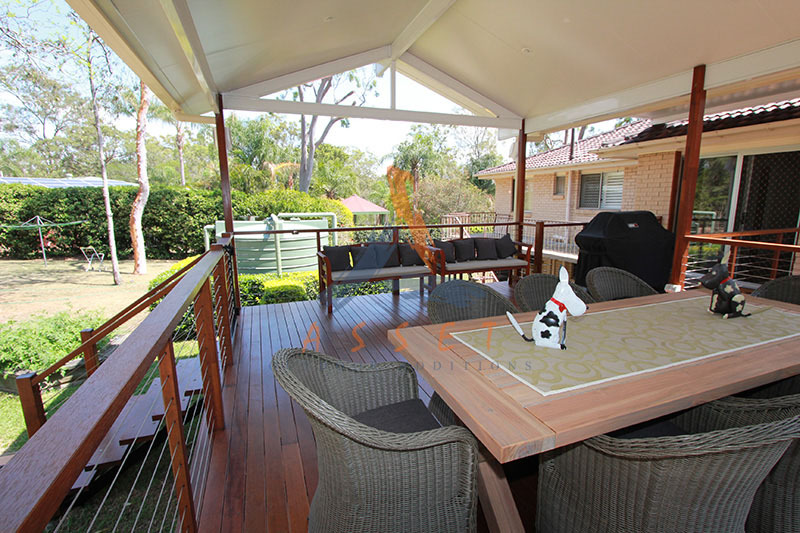 "I would like to thank your team for the completion of our patio. 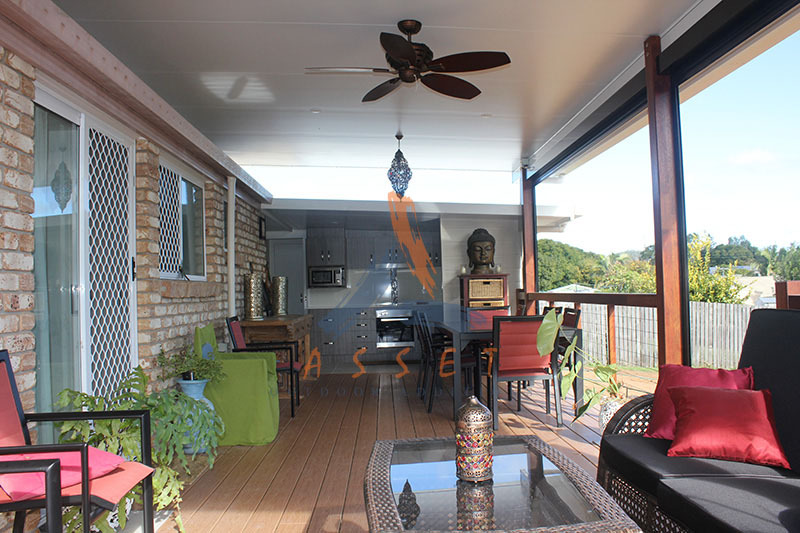 The team have done an excellent job and we are extremely happy with our home patio." 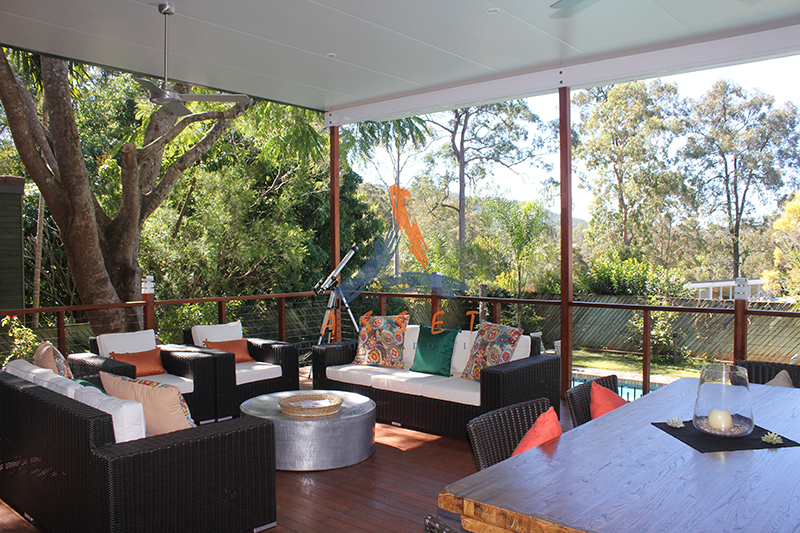 "Thanks to you all for our sensational outdoor living area. 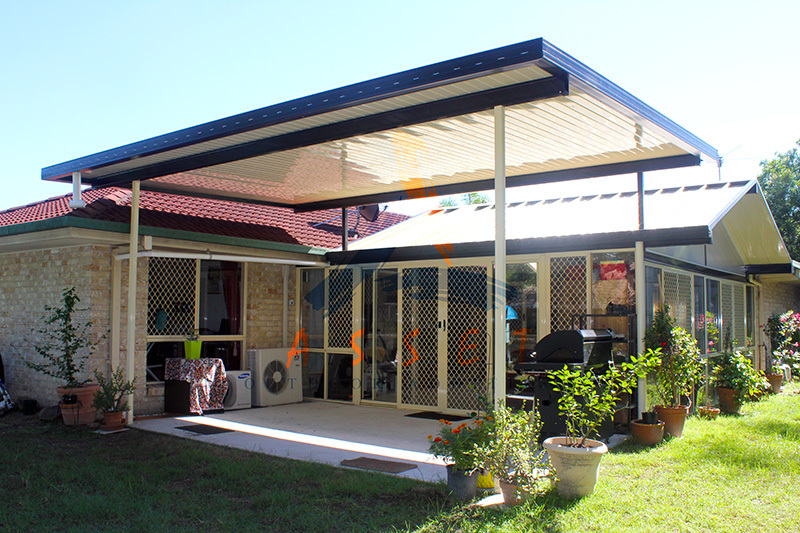 We are more than happy with the end result and would be happy to recommend your company to friends and family." 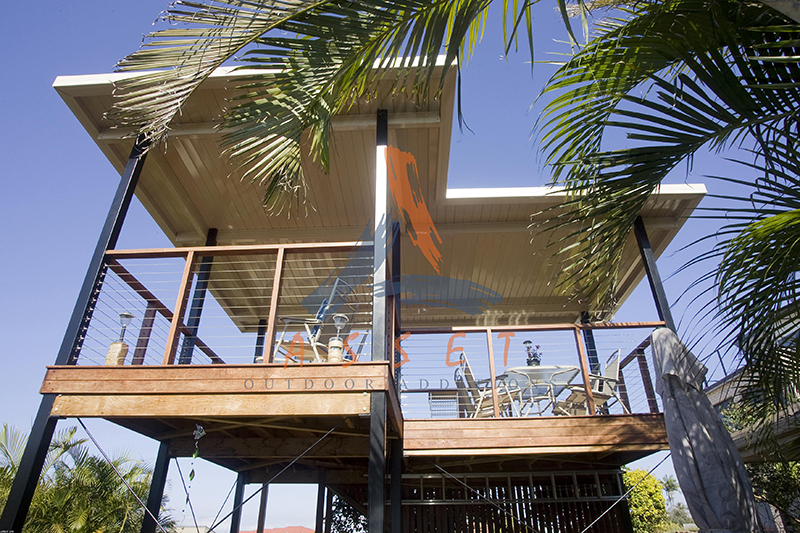 Our service is top notch, just like our patios. 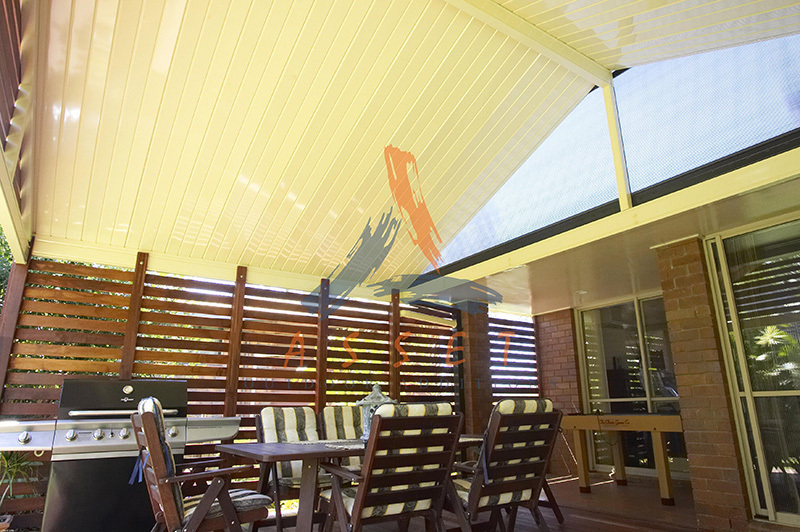 One of our highly trained design assessors will visit you at home, discuss your ideas, and provide an in-depth quote for your new patio roof. 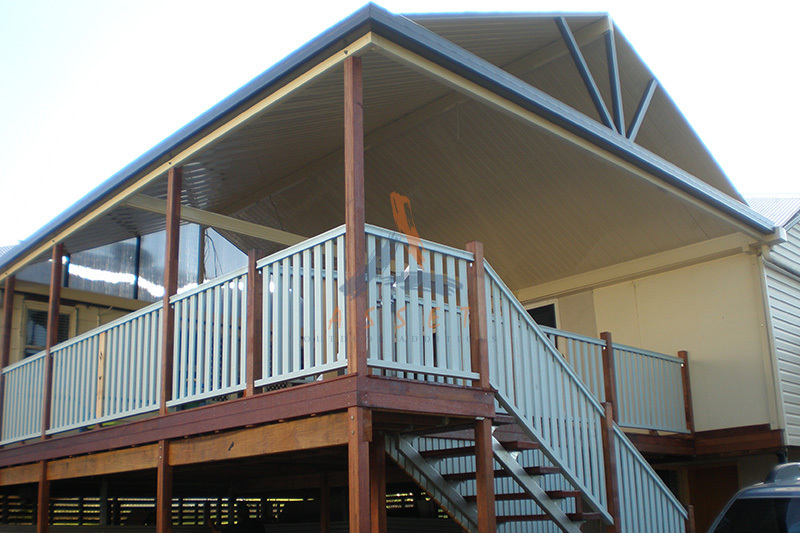 We can build just about anything! 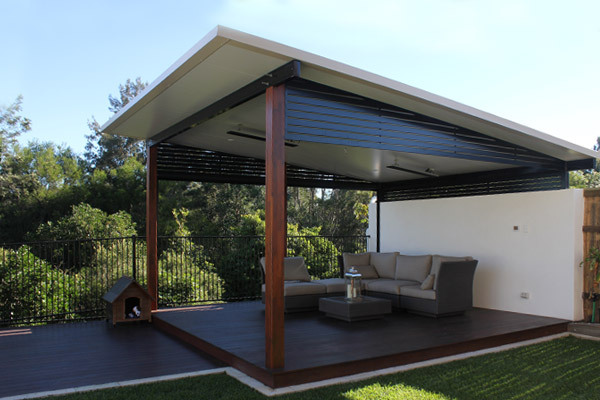 whether you want a simple patio, something more extravagant, or a patio completely out of the box, we can design a solution that fits your budget and needs. 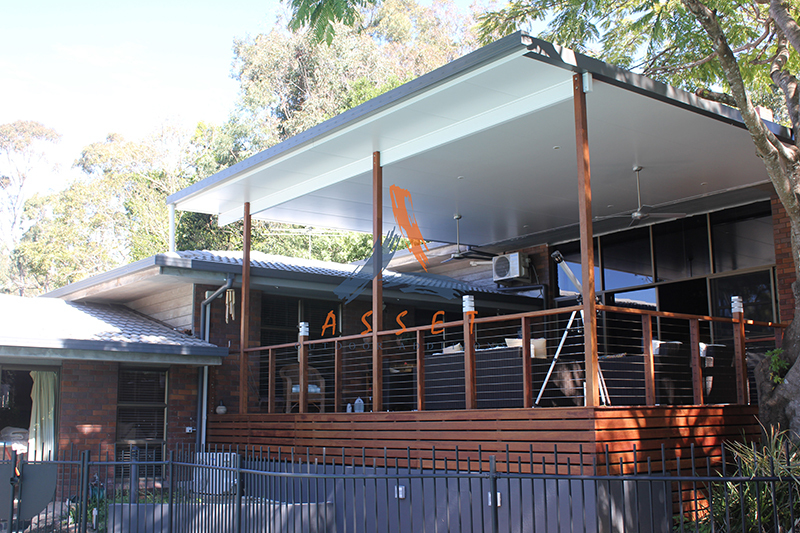 If you require council approval, our team will handle the entire process, including drafting of the plans, certifier submission and arranging the final sign off. 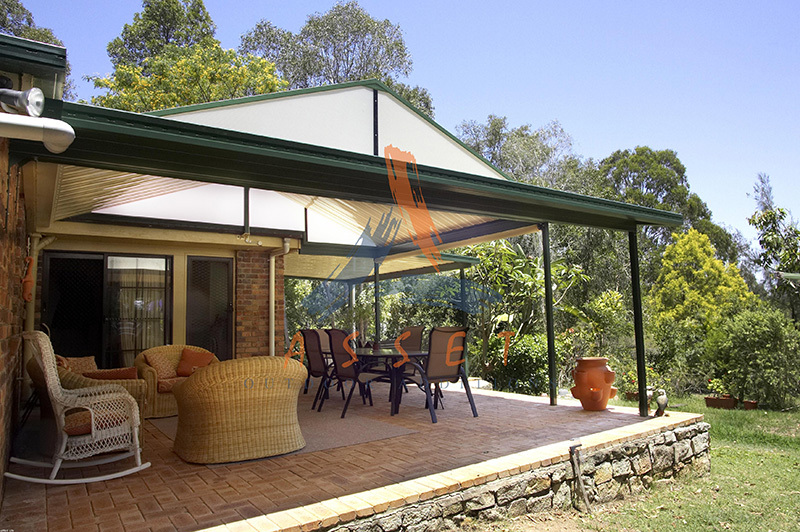 We offer a range of products from a selection of quality suppliers that offer warranties up to 25 years. 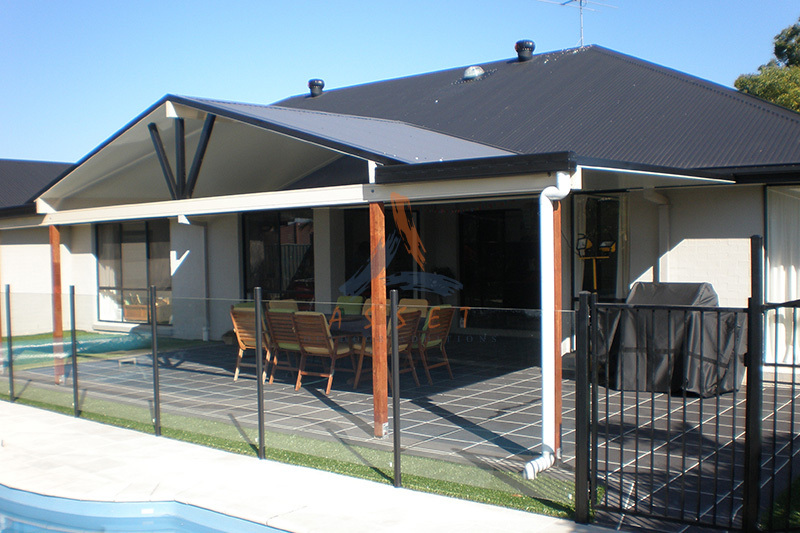 In addition to this we supply you with a six year structural guarantee, so you know you’re patio roof is in good hands! 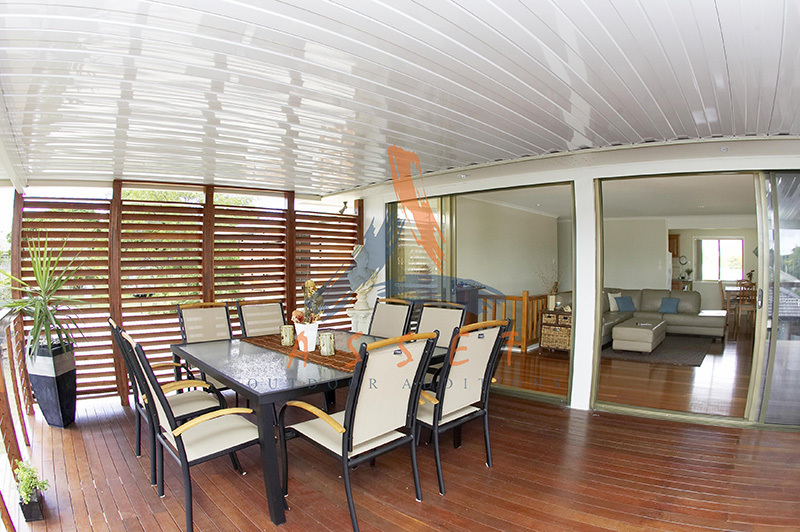 Our team of skilled builders share our passion for beautiful roofing, so their dedication to installing your new patio roof correctly and efficiently is second to none. 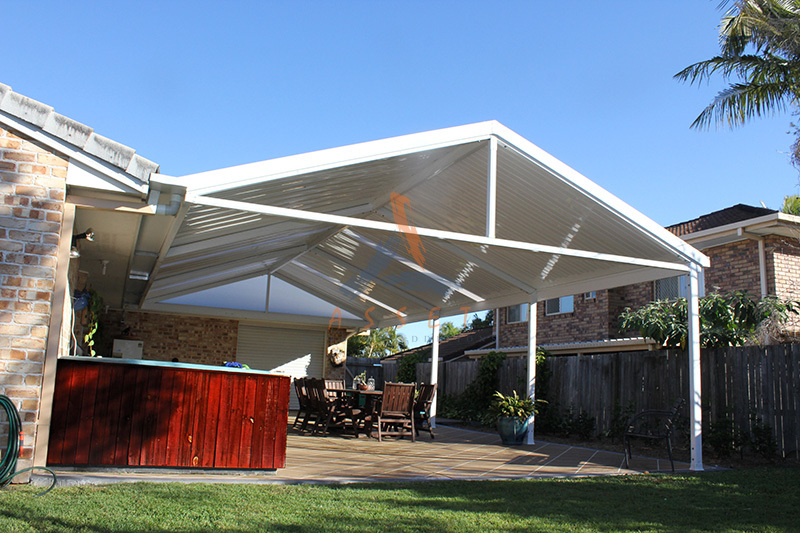 Want to install your new patio roof yourself? 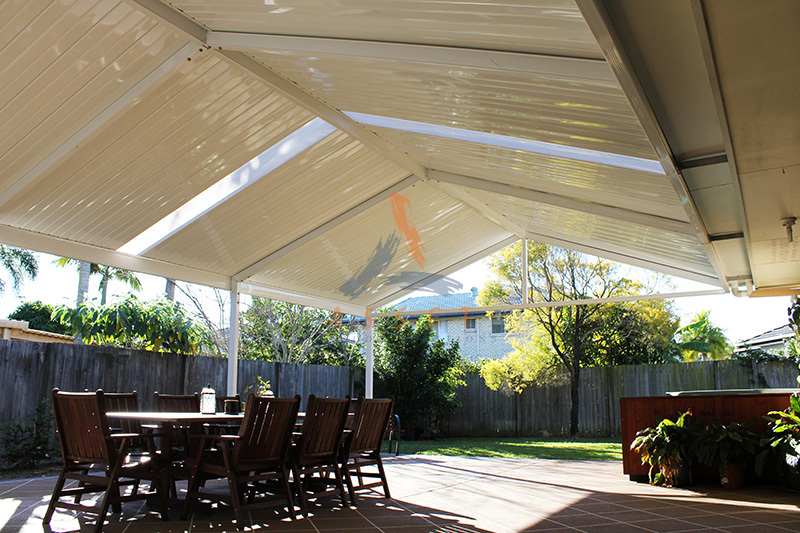 We can supply the whole kit and kaboodle plus deliver it to your door.